6 ZIPLINES & 30+ GAMES ! SEE YOU IN THE TREES !! FOR ALL THE FAMILY !! WILL YOU DARE TO TRY IT ?! Please read these answers to frequently asked questions (F.A.Q.) and do not hesitate to contact us if you have some more! During May, June, September & October, reservations are required Monday to Friday. Weekends and holidays we run on a drop in, first come, first served basis. During July & August, we do NOT take reservations. Due to the busy summer season, we operate on a drop in, first come, first served basis every day. 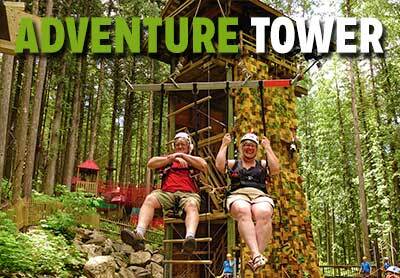 What are your age, height and weight restrictions for the SkyTrek activities? Sky Course (a.k.a. High Ropes Challenge Course): there is no minimum age, only a minimum height requirement of 4ft7″ (140 cm). The maximum weight of the adult program is 250lbs (113kg). Kids Tree Adventure: the minimum age is 5 years old, minimum height of 3ft7″ (110 cm), maximum height of 4ft7″ (140cm) and a maximum weight of 120lbs (55 kg). Jungle Gym: the minimum age is 2 years old up to a maximum of 12 years old. Adventure Tower: the minimum age is 6 years old, minimum weight of 45lbs (20kg) and the maximum weight is 250lbs (113kg). How long does the Sky Course (a.k.a. High Ropes Challenge Course) take? The Sky Course can take anywhere between 1-3hrs depending on your personal fitness level, how comfortable you are with heights, as well as how many other people are in the trees. Because July and August are very busy, plan to spend more time in the trees. We recommend wearing comfortable outdoor clothing, shoes or sport sandals (must have a strap around the heel, flip flops are not allowed) and appropriate dress for the weather and for climbing trees. Gloves are recommended but optional. Do not wear jewelry such as long earrings, bracelets, necklaces, rings etc. Please ensure you tie your hair back. Cameras can be taken into the trees using the strap to attach it to your harness or worn across the body if it has a long strap. Do I have to be really fit to participate in activities at SkyTrek Adventure Park? You do not have to be an Olympic Athlete to enjoy SkyTrek Adventure Park! Although it is not called a “Challenge Course” for nothing! It involves mental and physical challenges. With three difficulty levels within the Sky Course (a.k.a. High Ropes Challenge Course), you can choose how far you want to go. What is the longest zipline? We have seven zip lines altogether incorporated within the Sky Course. The longest one is over 100 feet long (35m)! You have to do the challenges to get to the ziplines. How high off the ground is it? The course starts low, and then gets higher as you continue. The highest part of the course is 40 feet off the ground! What happens if I am up in the course and I don't want to continue? At the end of each course there is the option to return to the ground. If you are in the middle of the course and do not want to continue, one of our experienced guides will come up and lower you to the ground. Can I climb the climbing wall or logger's climb more than once? You have 30 minutes to try climbing different routes or play around. On the Adventure Tower climbing wall, can I bring my own gear and/or lead climb it? 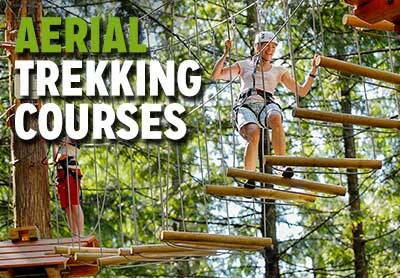 SkyTrek Adventure Park provides all the safety equipment for climbing and has an auto-belay system already in place. You may choose to bring your own purpose made rock climbing shoes, but all harnesses used must be SkyTrek Adventure Park harnesses. Chalk is provided but you can bring your own if you want to. What safety equipment is included in my SkyTrek Adventure? SkyTrek Adventure Park provides participants with a harness, helmet and all necessary safety equipment. Our professionally trained guides will demonstrate and teach you how to use the equipment and how to participate in all activities safely and successfully. You may choose to bring some snug gloves to wear for the Sky Course and/or purpose made rock climbing shoes for the rock wall at the Adventure Tower. Do I need to wear shoes on all of the activities? Yes. All of our activities, including the Kids Jungle Gym, require shoes with a heel strap. No flip flops! Up to 4 youths (under 16’s) can be accompanied and supervised by a chaperon from the course or on the ground. Youths have to stay in a 3 game radius to each other. Do I have to be supervised while playing in the Jungle Gym or Kids Tree Adventure? Yes, a parent/guardian of 16 years or older must stay in the area while you enjoy the activities. Are there ziplines on the Kid's activities? 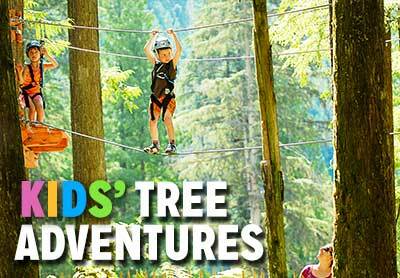 The Kids Tree Adventure has many of the same obstacles and games as the Sky Course, just on a smaller scale. There are no ziplines on Kids Tree Adventure. 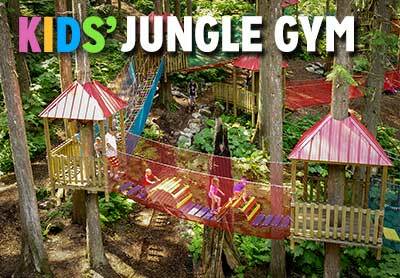 However, there is a zipline in the Kids Jungle Gym! Adventure sport activities have risks and all participants are required to sign a Release of Liability Agreement. Participants under 19 years of age will also need a parent / guardian to sign their waiver. You can sign it online now and gain time on your visit! Can my friends or family members join me at SkyTrek Adventure Park even if they don't want to participate? Your friends and family members are welcome to join you. They can walk, observe and support you from the designated walking trails below our courses. Helmets are required below the Sky Course. They are available at the reception at no charge – just tell the lodge receptionist you want to cheer your friends on. Is Skytrek open if it rains? Yes! Skytrek is open in the rain. Closure would only take place in the event of thunder, lightning or wind storms in the immediate area. Does that mean we have to leave if there are thunder/wind storms? No, if there is a thunder/wind storm right above us our guides will get everyone out of the trees. The storms in this area pass very quickly and once it is clear you can return to the trees. If you choose not to go back up into the trees SkyTrek is unable to provide a refund due to weather circumstances beyond our control. What time should I be here? As the Sky Course can take anywhere between 1-3hrs, we usually take our last group at 4:00pm. Although it is best to arrive earlier to ensure you have plenty of time to finish the course. In July and August, we advise you to come in the morning to ensure you’ll have enough time to complete the course. We take our last Kids Tree Adventure group at 5:30pm. For cancellation of group bookings please notify us a minimum of 48 hours prior to your booking! We accept cash, Debit, Visa and Mastercard. No American Express or personal cheques. Sorry! Yes, you can purchase gift certificates for any of the attractions of the park. Do you sell food & drinks? We sell snacks such as chips, cookies, chocolate bars, tuna snacks and edamame beans. We also sell bottled water, pop, gatorade, and coffee. Can I take a drink up into the course with me? You will need both your hands to go through the course and drinks dropped from a height may spill and possibly injure someone watching below… If you do need to take a drink it’s best if it can be securely attached to your harness. Get notified about season deals, promo codes, chances to win free admissions and season passes! 4 of BC most exhilarating activities! SIGN OUR ONLINE WAIVER NOW & SAVE TIME! VISIT THE ENCHANTED FOREST... IT'S NEXT DOOR! Our "twin" attraction! Same Location, Same Fun: don't miss it! 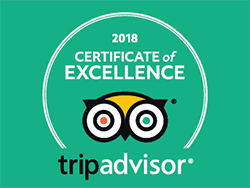 Old World fantasies (300+ hand-crafted Fairy Tales Figurines and houses), BC's tallest Tree House, the Castle and the Nature Walk (includes self guided Row Boat Tour).